There are many benefits of Pay Per Click (PPC) advertising. Whether you’re trying to grow your business or just trying to move with the time Google Adwords or PPC is a must for most local businesses. Many years ago most businesses would simply put an advert in the Yellow Pages or Thomson Local, and that advert would generate leads and revenue for the whole year, this was when the world was much more simple. Nowadays with the growth of the internet and the power of smartphones, the demand for using a printed directory has somewhat disappeared, with most of the big names now closing down their print-based products. Nowadays the new Yellow Pages is Google, but the interesting thing is that the need and demand for services are just as in demand but instead of them flicking through classified pages of a directory they simply type or say it into Google. Transferring your advertising spend from the nice big glossy adverts full and half page adverts is essential, and the best and quickest way to do this is by advertising with Google AdWords (PPC). The beauty of using a Big Fish Social Media is that there is no contract term meaning that you can pick and choose which months you wish to advertise, which is far more beneficial for seasonal businesses that don’t need to advertise all year round and we can be as flexible as you require. Plus there are more measurable benefits to using Google AdWords which means you start to understand your customers a lot more. Google Adwords (PPC) has so many positive advantages for most businesses especially when it comes down to local search. 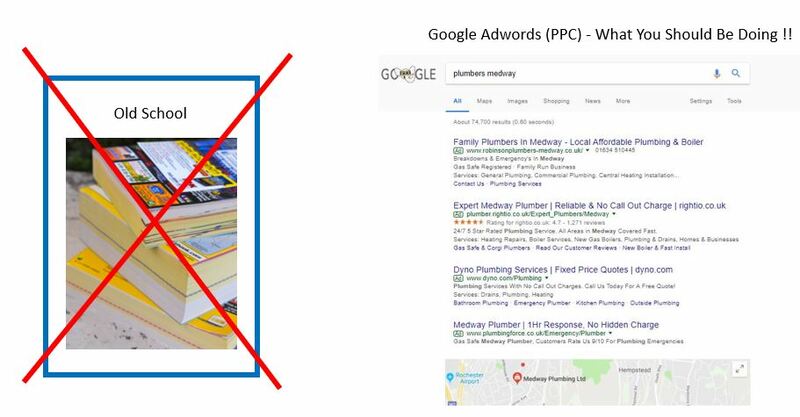 If you are not already doing any form of Google Adwords (PPC) advertising , then you are most likely losing out on relevant traffic and revenue. For more information on Google Adwords and how it can work for your business then call Big Fish Social Media for a free consultation.